OEM information for My Computer. Edit OEM Logo in Welcome center. 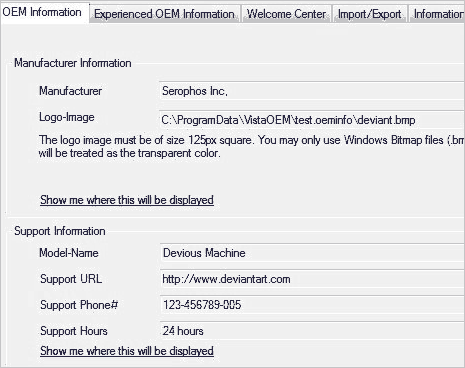 You can also import and export settings to a single file for easy sharing of your custom OEM themes. It works on all Windows Vista computer (both 32bit and 64bit). Download VistaOEM for free to edit OEM information on Vista computer – useful for those wanting to add personal touch to information being displayed.